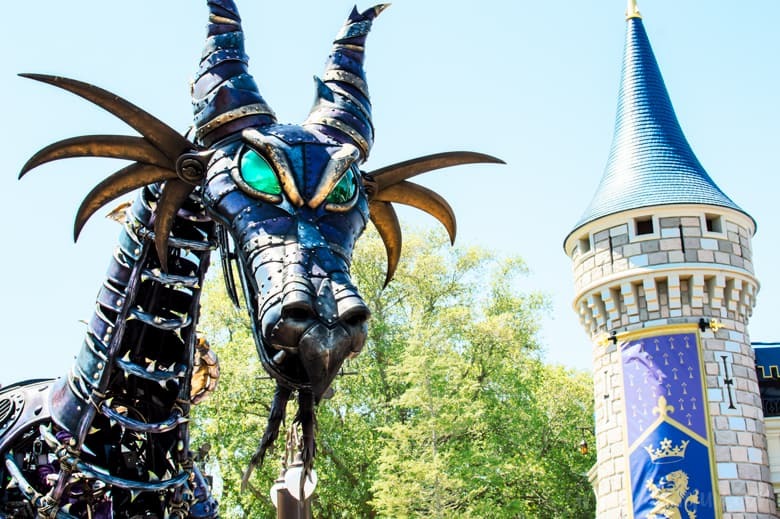 Don’t miss out on Disney’s Festival of Fantasy parade! Be less stressed and have more fun with these simple tips to get the most out of the show. Chris and I have two different philosophies when it comes to doing Disney; I love to stop and watch the parades and fireworks shows and he would much rather go on rides during those times. He always likes to tell me that’s the way the “regulars” do Disney, because they know that the lines are shortest during the parades and fireworks shows. And while I know that’s true, I don’t care. Because I love experiencing everything that Disney has to offer, and that includes shows! While I haven’t seen the Electrical Parade in a while, I will always stop and watch Disney’s Festival of Fantasy Parade. It’s a favorite of mine! If you haven’t stopped to watch Disney’s Festival of Fantasy Parade you are missing out. No, seriously! It’s such a fun show. I love the music and the interaction of the characters with the crowd. But what I love most are the picturesque moments you get if you want to shoot the parade, which I often do. If there is one thing I’ve learned over the years it’s that getting a good spot for parades and fireworks shows means showing up at your preferred spot at least an hour early (find out where the best spots are here). I always love shooting this parade down near the castle or on Main Street and we like to get there an hour ahead of time to make sure I can get in a good spot for the photos. If you’re looking for a good spot to sit down at, head to the train station. It’s shaded and they have chairs! But, for those spots I’d recommend getting there no later than 90 minutes ahead of time. Those seats go fast because it’s a great spot to relax! But don’t be that person who gets to the parade route fifteen minutes before it starts and then tries to shove your way to the front (or push your kids in front) of people who have obviously been there for a while! Be aware that front row spots go quickly and you must get there early to get one of those spots. If you’re getting to your spot early then you’re going to get hot and hungry. This parade starts at 3:00pm and (unless you’re sitting in the shade at the train station) you will be in direct sunlight for the better part of two hours. On our last visit I got a pretty good sunburn on my arms because we were waiting by the castle for the parade to start. Chris and I usually eat before the parade, but on the off-chance that we don’t have time we like to bring snacks with us to hold us over. We also make sure to get some ice cold water (or Starbucks for me!) to sip on while we wait. You do not want to get dehydrated while at Disney. I’ve done it before, it’s not pleasant. So funny story, Chris bought a GoPro for us to use on our last Disney trip so we could get some fun videos of our little guy experiencing the parks. Guess who forgot to check that it was charged every single night before we went to bed? Chris pulled it out to use for the parade and then realized it wasn’t turning on because the battery was dead. Oops! Personally, I own two camera batteries for this reason alone (an extra battery was on my wish list at one point!). I never want to be stuck at Disney with a camera I can’t use because I forgot to charge the battery. But if you don’t have that option then try to remember to plug it in every night before bed! And then double check that it’s charged in the morning. You don’t want to miss out on pictures because you forgot! Disney’s Festival of Fantasy Parade starts every day (weather permitting) at 3:00pm. But even so, it’s always good to double check the times guide so that you don’t miss the shows you want to see! However, here are a few things you need to know about this parade. First, the parade starts in Frontierland and ends on Main Street. So even though the guide says the show starts are 3:00pm the parade won’t get to you until 3:15-3:20pm if you’re waiting on Main Street. That may not be a big deal to most, but if you have a 4:00pm Fastpass that you need to get to it may be better to watch the show in Frontierland so you don’t have to deal with the crazy crowds after the show. And honestly, the route in Frontierland isn’t as crowded as the one on Main Street…so that’s a bonus! While I love this parade and think everyone needs to see it at least once I will never recommend getting a Fastpass for it (even though we love Fastpass+). Disney tends to overcrowd the Fastpass areas and if you aren’t one of the first few to show up when they start letting people in you probably won’t get a stellar spot. To be honest you’d probably have a better time finding a spot elsewhere, and that’s what I’d suggest doing instead. 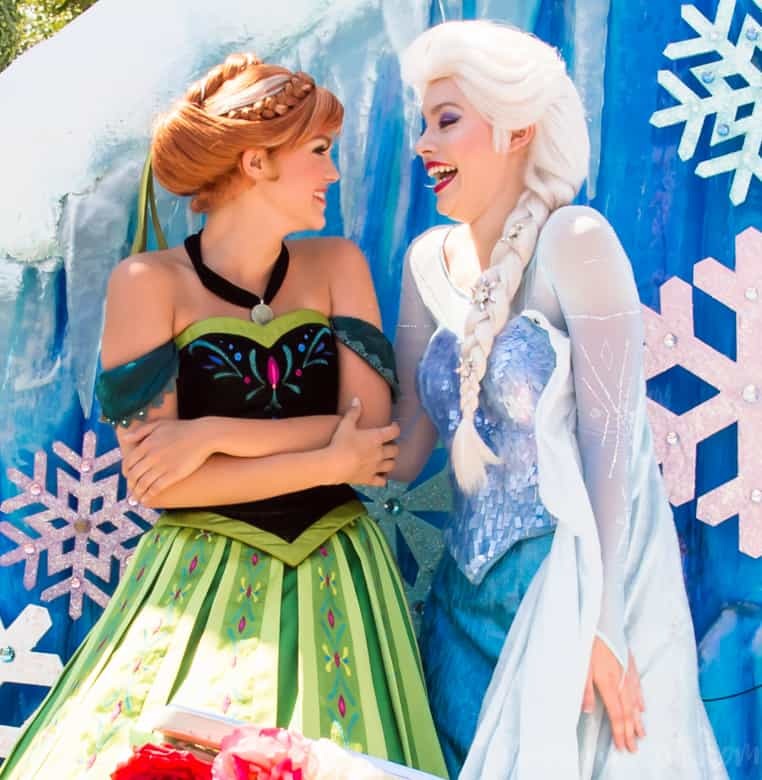 Now, if you don’t care about a front row spot or if you want to go on a few rides before the show and don’t have time to stake out a spot a Fastpass may be the way to go for you. But if you can avoid it, I would! 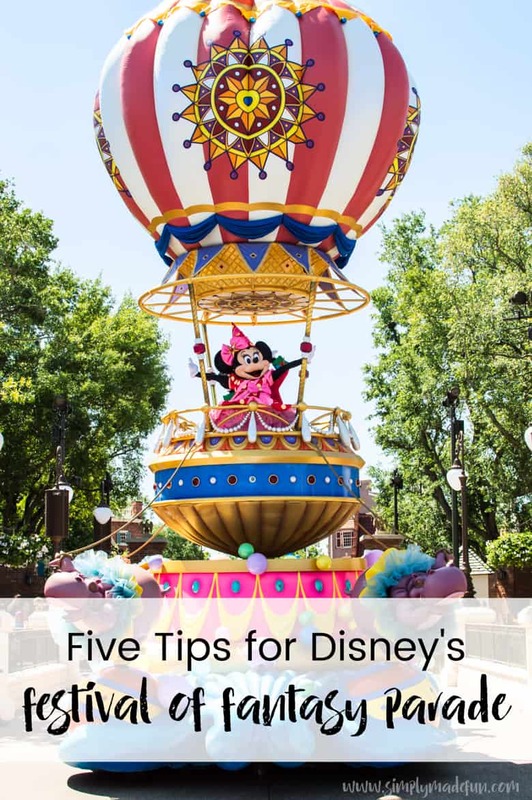 So, those are my five favorite tips for Disney’s Festival of Fantasy parade! It truly is a beautiful parade (I have my thoughts on why here) and a lot of fun to watch. I really do suggest you stop and see it for yourself! 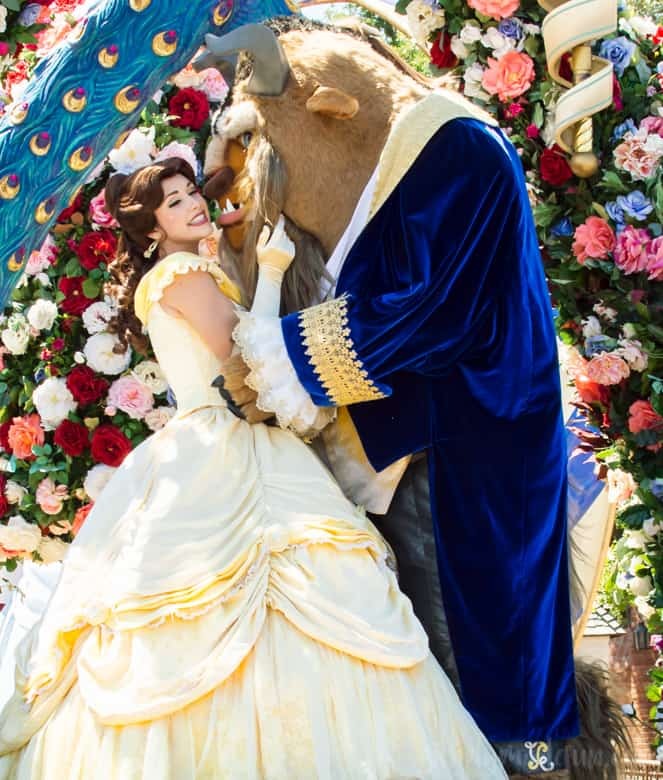 Have you stopped to watch Disney’s Festival of Fantasy parade? What did you think?